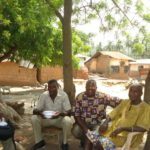 TPRF volunteer Lisa Rossetti recently fulfilled a lifetime ambition of returning to her childhood home in Ghana. She shares her moving story with us in this week’s post. 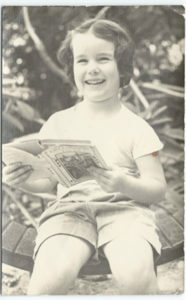 I was a colonial child, brought up in the Gold Coast in the early 50’s. We lived in the British colonial quarter on the outskirts of Accra. (I have pieced this together from correspondence and memory, as there were no postal addresses in those days.) I remember painting the Flag of Independence at my school, proud and excited. Innocently, I believed Ghana to be my home and my nation. In March 1957, my father took me for a walk down Independence Avenue. The newly-built white arch and star gleamed in the early morning sun. Tall flagpoles topped with golden eagles lined the long road. 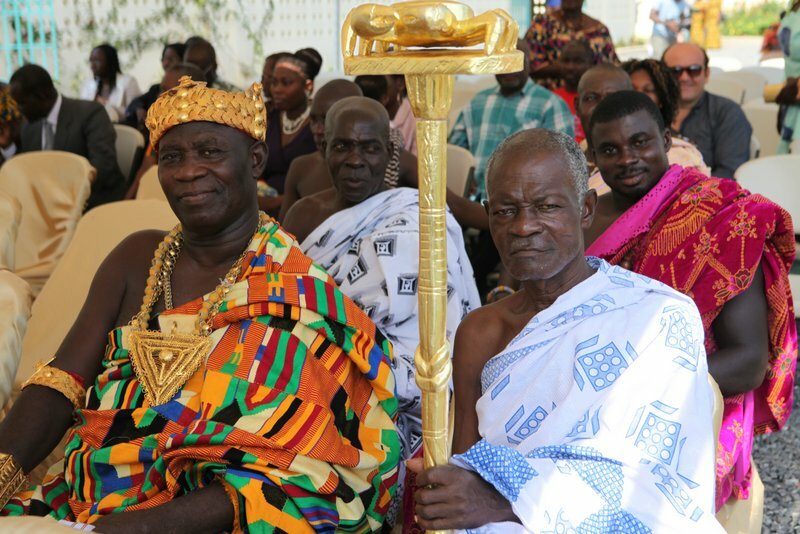 The country was preparing for vast celebrations and tribal gatherings as Ghana reclaimed its independence from Great Britain. Just five months later, we were boarding the plane back to England. We were leaving for good. My parents made new lives for themselves in England. My mother put a few mementos around the house; some Ashanti gold weights, a carved wooden stool, some woven place mats, and an African mask on the wall. We never went back. Then in 2009, I discovered a story I’d once written about that mask. I unearthed a box containing letters as well as some black and white photographs of our house in Accra. Vivid images and memories of my childhood began to rise to the surface. 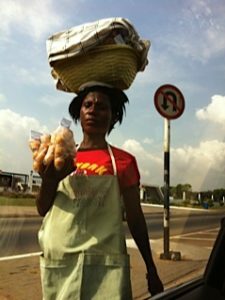 I experienced a deep desire to return to Ghana. But the journey seemed impossible somehow. 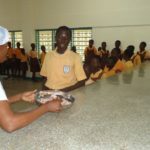 Ghana was too out of reach financially, too far away in time and place. 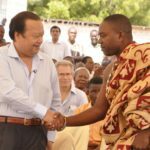 A couple of years later, I became a volunteer for The Prem Rawat Foundation. 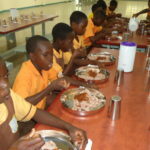 I followed avidly the development of the new Food for People facility near Accra. I offered to write an article about the centre if the opportunity arose. Then the chance finally came. In November 2012, my husband had some work with Words of Peace Global in West Africa, and he offered to pay for me to travel with him. 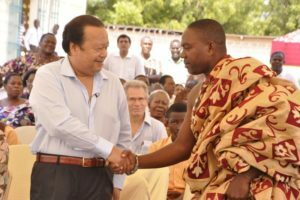 We planned to attend a conference with Prem Rawat in Accra and also to visit the TPRF Food for People centre in Otinibi. I was both overjoyed and scared. 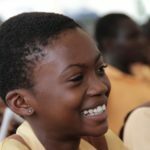 What if I found Accra changed beyond all recognition? What if I had no connection whatsoever with the people? Landing at Kotoka airport, walking down the steps from the plane, I am standing on Ghanaian soil for the first time in 55 years. The airport is much bigger than I remember! But the sounds and smells, the pungent aroma of fruit and dust, are somehow so familiar. 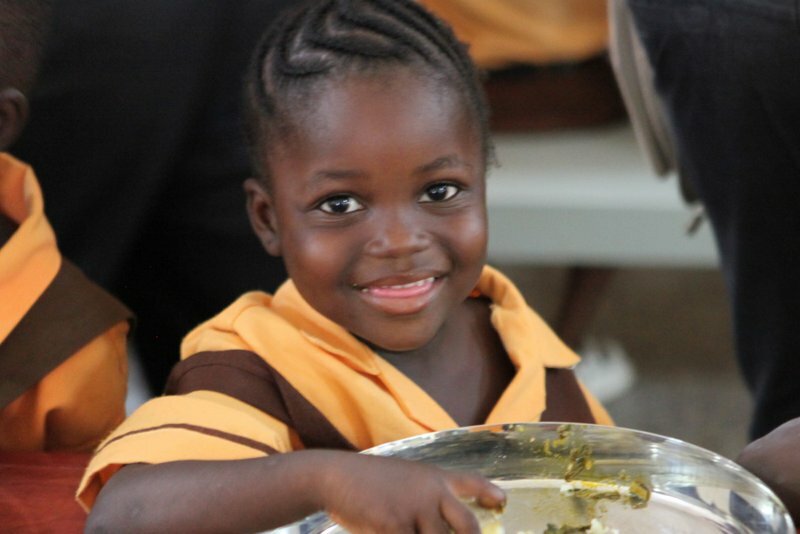 On a hot and humid morning, we drive out of Accra to the Food for People center in Otinibi. Colorful stalls line the roadside. Street vendors are everywhere, hawking tea-towels, iced water, nuts, scouring sponges, CDs, magazines, slices of coconut. Once we turn off onto the bumpy track to Otinibi, the memories come flooding back again. Over there is the same skinny chicken scratching in the dust, the tiny scrap of shade under a spindly tree, ramshackle buildings roofed with corrugated iron. Poverty is still here. We arrive at the center. I am struck by its simplicity. Inside all is order and cleanliness, with rows of tables and fans overhead. The Center Manager welcomes us. She takes me for a tour of the kitchens, the vast pots, huge mounds of yams, and the vegetable garden. I tell her my tale: “I used to live here in Accra as a child.” She looks me in the eye and smiles. “Welcome home,” she says. I have tears in my eyes. Then the day of the event arrives. I have a guest to invite—a young artist who is exhibiting his paintings in my hotel. The foyer is packed with a throng of people, many in their local dress, a swirl of bright colors and happy voices. When Prem Rawat takes the stage, the hall explodes with delight. The entire audience rises to its feet, waving white pieces of cloth in a traditional welcome. There is laughter and rapt attention. He tells us that we are more related to the sun, moon and stars than to our father, uncles or aunts. I am so moved to be sitting here in Accra, listening to his words of peace and wisdom. The circle feels complete. What did I learn? We are all truly connected at the heart of us. Nothing is as impossible as it may seem. We only have to stretch out and make a little effort. What we want and need is closer to us than we think. Wow!!! we can do so much in one lifetime – great article Lisa and the photos are so cool including Lisa at 7! THIS ARTICLE IS AWESOME…I LIKED READING IT…HOPE THAT U WOULD POST MORE FOR US..
What a beautiful story Lisa. I know you so much better now..I’m so happy you were able to go and reconnect with this part of your life. Thank you for sharing. What a lovely story Lisa and to see at firsthand the wonderful work of TPRF. The possibilities are endless and that we can witness and be inspired by these stories as the best of humanity.. Thank you for your inspiring, hopeful and loving story! It’s heartfelt for sure! How touching. Loved you at Seven…..! Amazing work tprf…..lovely writing Lisa. Its a project all can support isn’t it?. Wonderful and very inspiring article- thank you for writing- and posting it. Thank you for articles like these. Thanks Lisa for the feelings so well expressed. This inspires me to help spread this message in any available way. Let’s get more WOPG shows on their (Ghana) and other African countries’ TV stations! What a wonderful article, I was very moved by it. It is wonderful to see people working in harmony. We are family.